NETWORK FINALS: THE BACHELOR gained 0.1 in final numbers, and QUANTICO lost the same. CABLE HIGHLIGHTS: AMC’s HUMANS began its 2d season at 0.20, down 0.15 from its August 2015 finale (which aired on a Sunday). The finale of HBO’s THE YOUNG POPE remained at last Monday’s 0.10 (that was down 0.06, though, from Sunday’s installment). As usual during the Monday Night Football-less season, Monday cable was a duel between VH1 and USA. VH1’s LOVE & HIP-HOP claimed the night, down 0.02 to 1.20, with the return of MARTHA & SNOOP’S POTLUCK DINNER at 0.63/0.56. USA’s WWE telecast was at 1.15/1.12/1.05, compared to last week’s 1.19/1.16/1.06. MTV’s TEEN MOM slipped 0.03 to 0.83. 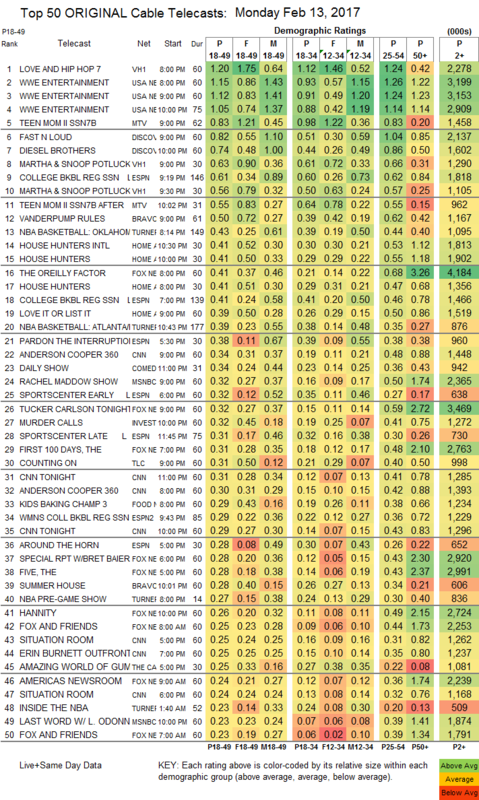 On Discovery, FAST N LOUD rose 0.11 to 0.82, and DIESEL BROTHERS was up 0.12 to 0.74. ESPN’s West Virgina vs. Kansas COLLEGE BASKETBALL game was at 0.61, while TNT’s NBA games were at 0.43 (Oklahoma City vs. Washington) and 0.39 (Atlanta vs. Portland). On Bravo, VANDERPUMP RULES fell 0.07 to 0.50, and SUMMER HOUSE ticked up to 0.28. 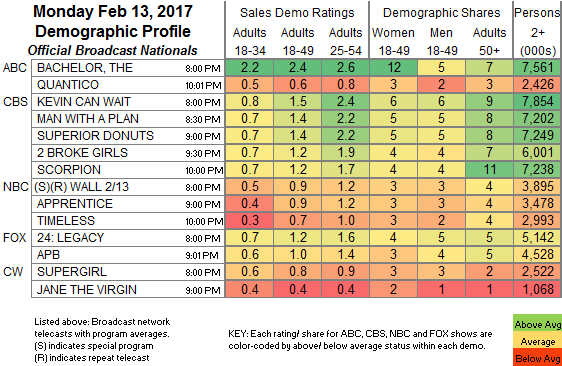 HGTV’s HOUSE HUNTERS and HOUSE HUNTERS INTL were both at 0.41, respectively down 0.05 and 0.02, with LOVE IT OR LIST IT steady at 0.39. On TLC, COUNTING ON held at 0.31, and SUDDENLY RICH was down 0.05 to 0.14. Food Network’s KIDS BAKING CHAMPIONSHIP dropped 0.12 to 0.29. On Freeform, SHADOWHUNTERS fell 0.08 to 0.21, and BEYOND was down 0.02 to 0.09.